Did any of you keep up with any of the amazing fashion during New York Fashion Week? Sally Hansen recently contacted me and asked if I would act as an ambassador for their new I Heart Nail Art campaign. I excitedly accepted! This month's theme is "runway," and I'll admit, I was a little worried that I would be overwhelmed by all of the choices. I began my hunt for inspiration by browsing the Rodarte show. Luckily for me, shortly after I started looking, one of the dresses just jumped out at me and screamed "Paint me, paint me!" It had an interesting mix of a sweet and delicate floral print on top and a bold and eye catching tie-dye design on the bottom. I was (and still am!) really intrigued by the contrast and got started trying to figure out how to paint the designs on my nails. The good news? I think I figured the designs out! The even BETTER news? I made some tutorials so you can give them a try, too. Read on! I used seven different Sally Hansen products from four different lines for this look. Watch the video to learn more about the techniques! For those of you that prefer step by step photo tutorials, I've got those too! Begin with a base of White On. Using Rapid Red and a small nail art brush, paint feathery strokes spiraling outward from the middle of the nail. Add some depth to the red spiral by painting on accent strokes in Pat On the Black. Starting further out from the center this time, add a blue spiral using Pacific Blue. Don't cover up all of the white space, we want some of it to show in the finished look! Using Night Flight, fill in the space between the inside edge of the red spiral and the outside edge of the blue spiral. Clean up the edges of your nail using a makeup brush dipped in acetone and finish with topcoat. Begin with a base of Polished Pearl. 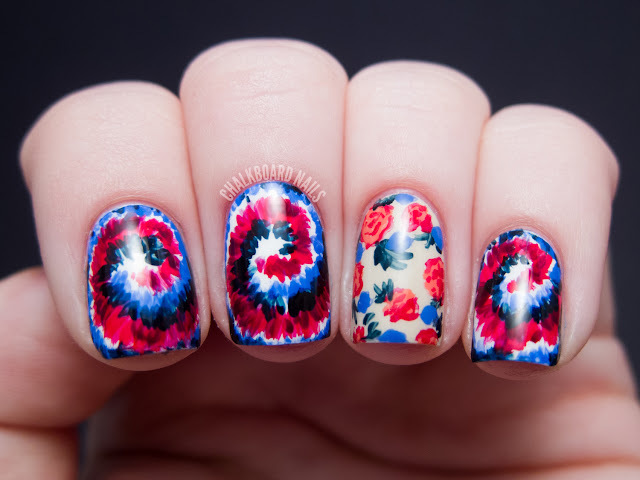 Add some flower shapes using a nail art brush. 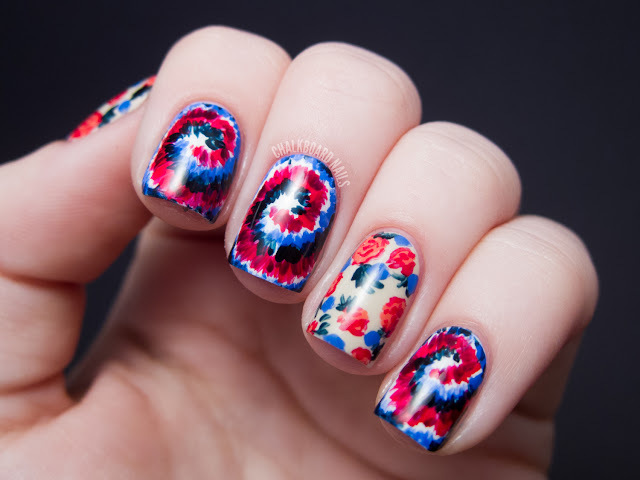 Make them different sizes, and try to scatter them on the nail. Give your flowers some petal definition by adding some lines in Rapid Red. 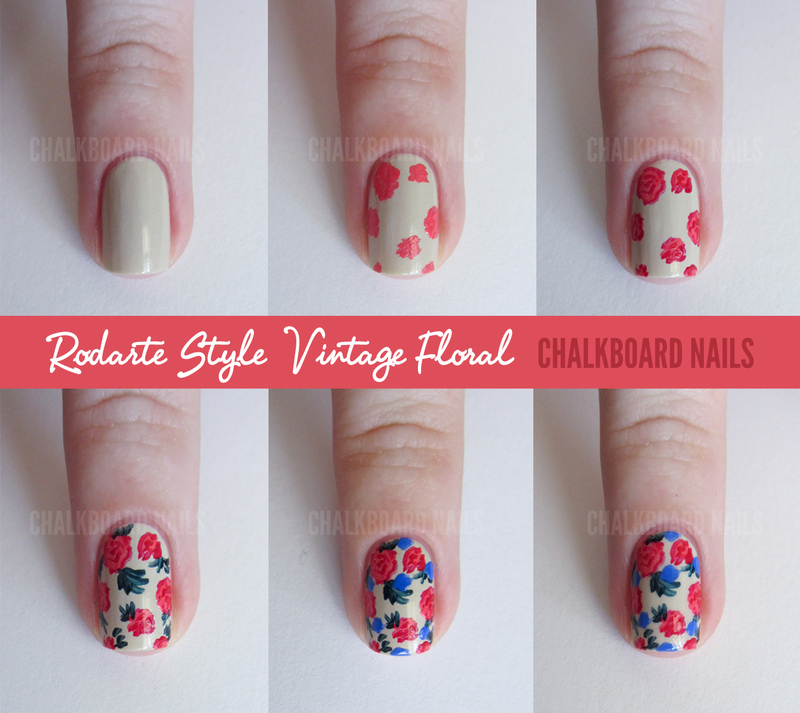 If you have trouble with this step, try using a toothpick to draw the lines instead of a nail art brush. Add some leaf shapes with Night Flight. Leave a bit of negative space open for the next step! Paint on some smaller blue flowers with Pacific Blue. Don't be afraid to paint over some of your leaves if you have to. If any polish has ended up on your finger, clean it up with acetone and a makeup brush. Finish with topcoat. What do you think about this mix of patterns? 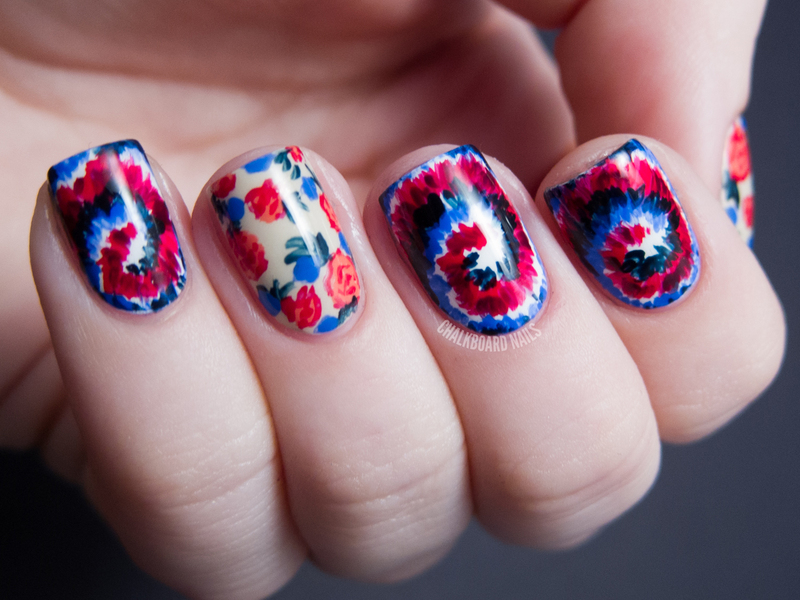 I love the hardness of the tie dye with the softness of the flowers. Stop by the Sally Hansen I Heart Nail Art campaign page to learn more about this exciting opportunity and the prizes that are up for grabs. I know some of you have amazing nail art skills that are just begging to be shown off, so don't be shy! I love the mani! Thank you for the tutorial! I am going to need to try a tie dye mani soon. I'm a hippie chick so I Luv the tyedye look. Gorgeous! 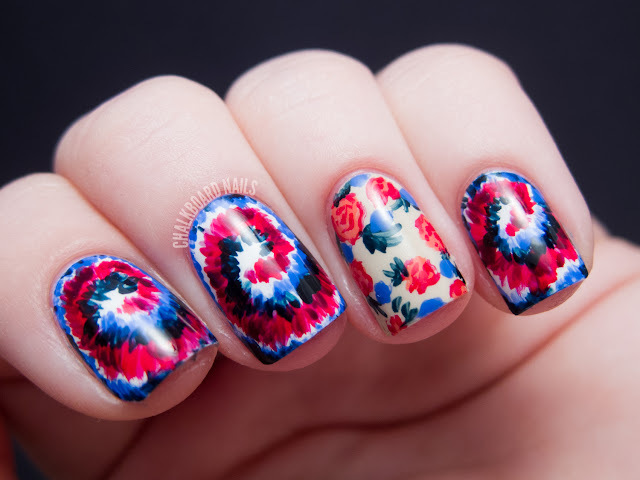 I love the flower print the most. You are so freaking talented ♥! omg gorgeous!! i absolutely LOVE the floral design! so sweet and feminine. thanks for the tutorial! Wow! You are so good! At first look, I thought they were Sally Nail wraps!! this is amazing! i love your tutorials too! How cool! Great tutorials! You make it look easy! Hehe! Mmmmm I LOVE this design! 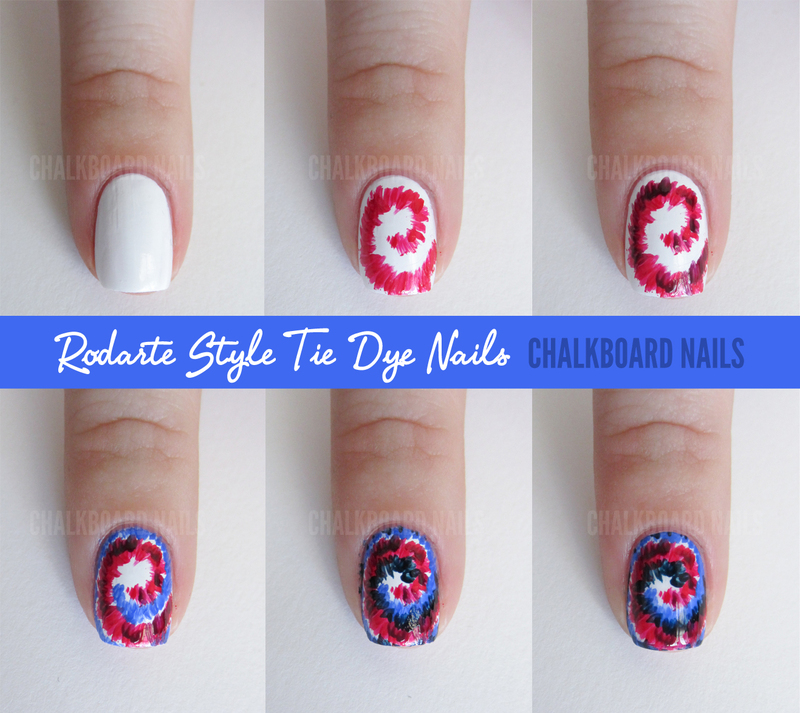 This is a great technique for tie-dye too, I'll definitely have to try it out! This is amazing!! Such a bold, pretty design ♡　And thanks for a great tutorial, I will definitely be trying this out !! Lovely! What nail art brush are you using in the video? I've been looking for one like that for a while but can't find one! Hi! The brush is from a nail art brush set by Bundle Monster. I loved ur video!! I'll try to do it soon! !